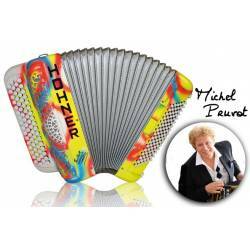 Hohner Fun There are 23 products. 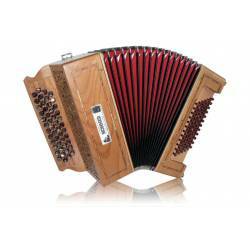 Versatile, lightweight and low priced study chromatic button accordion for children. It has 31 keys, 2 voices, 2 registers on the right hand, and 4 voices, 40 bass on the left hand. Perfectly adapted to a child's anatomy. Factory: Hohner Asia. Comes with shoulder straps and case. Free-bass study accordion for children with 48 keys on the right hand and 49 bass buttons on the left hand. It has all the features needed to embark on a journey of classical music. Factory: Hohner Asia. Comes with shoulder straps and case. Versatile, lightweight and low priced chromatic button accordion for children, featuring 48 keys, 2 voices, 2 registers on the right hand, and 4 voices, 60 bass on the left hand. 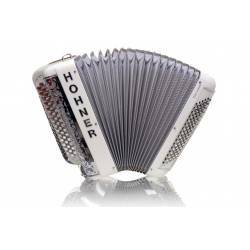 The Hohner Nova II 60 is suitable for children with at least 2 years of accordion study and practice. Factory: Hohner Asia. Comes with shoulder straps and case. 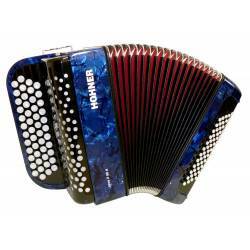 Very versatile, lightweight, compact, and low priced study chromatic button accordion. It has 72 keys, 3 voices, 5 registers on the right hand, and 4 voices, 3 registers, 96 bass on the left hand. 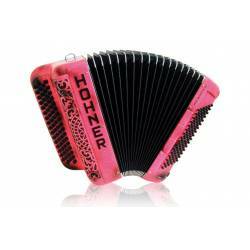 The Hohner Nova III 96 is suitable for advanced students. Factory: Hohner Asia. Comes with shoulder straps and case. 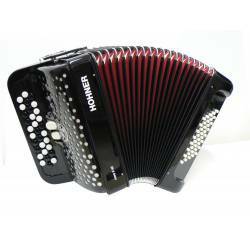 Versatile, lightweight and low priced study chromatic button accordion for children and shorter players. It has 60 keys, 2 voices, 2 registers on the right hand, and 4 voices, 80 bass on the left hand. 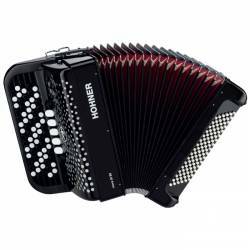 The Hohner Nova II 80 is suitable for advanced students. Factory: Hohner Asia. Comes with shoulder straps and case. Chromatic button accordion designed for children aged 6 and above. It has 48 buttons, 2 voices on the right hand and 4 voices, 60 basses on the left hand. It is the smallest model in the fun series, weighing only 6 kg. Factory: Hohner Italy. Also available for rent. Comes with shoulder straps and case. 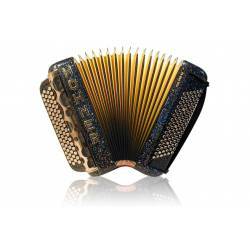 Designed for traditional folk and world music, this versatile, lightweight and compact chromatic button accordion has 50 buttons, 3 voices, 4 rows (5th optional) on the right hand, and 4 voices, 72 bass on the left hand. Factory: Hohner Italy. Also available for rent. Comes with shoulder straps and case. See the customizing guide for all available options. 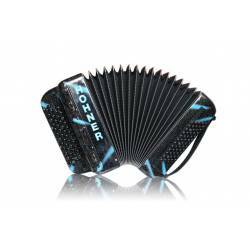 High quality chromatic button accordion for beginners, with 60 buttons, 2 voices, 1 register on the right hand and 4 voices, 80 bass on the left hand. Its "short stroke" keyboard helps reduce finger pressure. 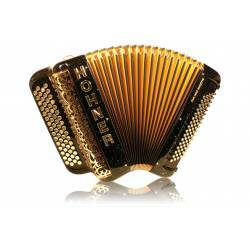 Factory: Hohner Italy. Also available for rent. Comes with shoulder straps and case. See the customizing guide for all available options. 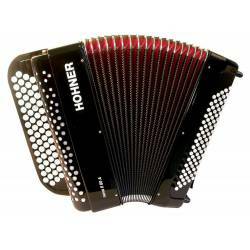 Beginner-friendly 96-bass chromatic button accordion with 64 buttons, 2 voices, 1 register on the right hand main and 4 voices on the left hand. Lightweight (7 kg) , with short stroke keyboard for reduced finger pressure. Factory: Hohner Italy. Also available for rent. Comes with shoulder straps and case. See the customizing guide for all available options. Versatile 96-bass chromatic button accordion. It has 66 buttons, 3 voices, 6 registers on the right hand and 4 voices, 3 registers on the left hand. Factory: Hohner Italy. Also available for rent. Comes with shoulder straps and case. See the customizing guide for all available options. 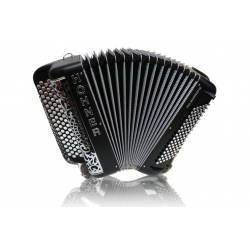 Versatile, compact and lightweight 96-bass chromatic button accordion with tone chamber. It has 66 buttons, 3 voices, 6 registers on the right hand and 4 voices, 4 registers on the left hand. Ideal for live performances. 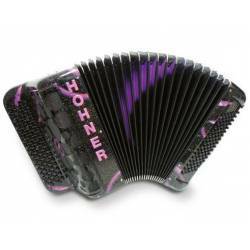 Factory: Hohner Italy. Also available for rent. Comes with shoulder straps and case. See the customizing guide for all available options. 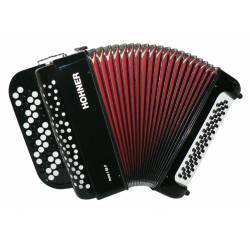 Versatile, compact and lightweight 120-bass chromatic button accordion with tone chamber. It has 70 buttons, 3 voices, 6 registers on the right hand and 4 voices, 4 registers on the left hand. Ideal for live performances. 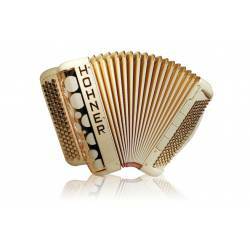 Factory: Hohner Italy. Also available for rent. Comes with shoulder straps and case. See the customizing guide for all available options.